Please note that the content of this book primarily consists of articles available from Wikipedia or other free sources online. The Catholic Church of Austria, part of the worldwide Roman Catholic Church, is under the leadership of the Pope, the curia in Rome, and the Conference of Austrian Bishops. 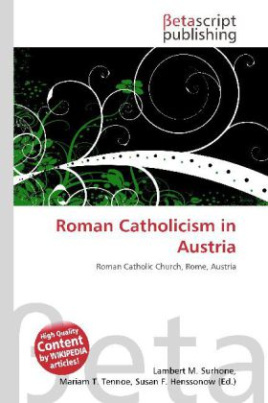 The Austrian church is the largest Christian denomination of Austria, with, according to the 2001 census, 5.9 million people (approximately 73.6%). In 2001, the number of Sunday churchgoers was around 11.5 percent (as percentage of the total Austrian population that is 914,348 churchgoers out of a total population of 8,043,000). Since 2001, the number of Roman Catholics (and number of churchgoers) has fallen, primarily due to secularization and immigration.